* This post does contain affiliate links. These result in no increase cost to you as a consumer, but simply a small percentage of the sale goes to us for directing you to them. We only will ever post links about items that we would use ourselves and you are never expected to buy anything. With the first flowers blooming and green showing, spring is here! I love the weather right now with lots of variety, but warm enough for just sweaters. Avery and I are big fans of winter and snow, but we are quite exuberant to see the new opportunities that spring will bring us. 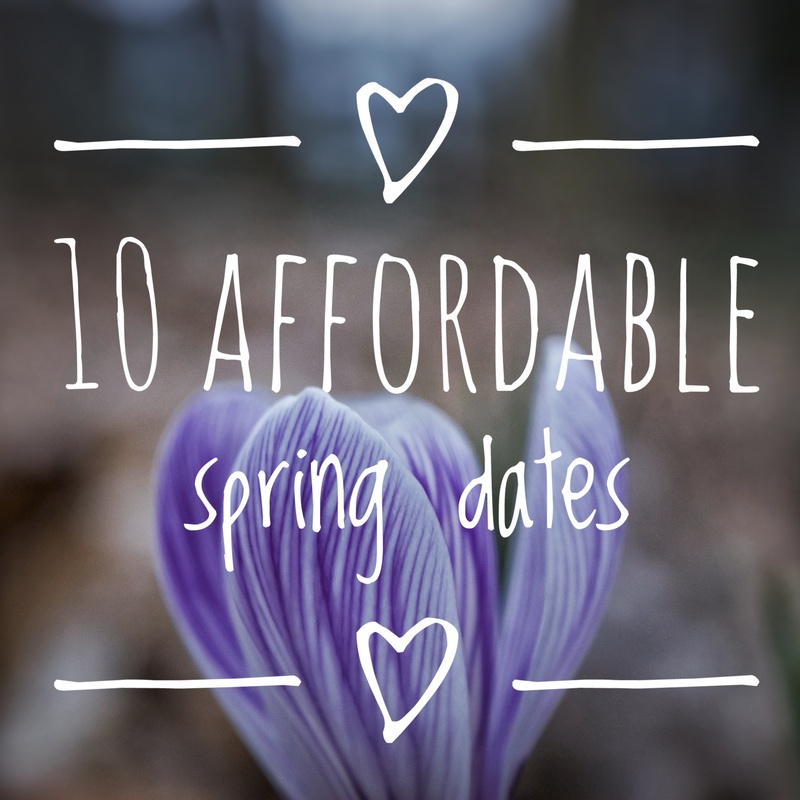 Avery and I definitely have a long history of dating which you can check out a bit more here, but without further ado let me share with you some my favorite affordable spring dates! Picnics! Okay everyone has heard of this one, but it is such a nice classic. I have a blanket that I use just for picnics and it is one of those dates that you really control how much you spend. I love cooking so it keeps us from going out to lunch and spending more money. Plus you get more privacy and space in a park than at a restaurant. I will say Avery and I love asian food. He will tell you I have an obsession with sushi and it is so true. So one of my favorite things on this planet it bento boxes. They are great for picnics and very affordable lunch boxes. I totally recommend checking out the one below for an affordable and stylish upgrade from tupperware. This bento box is great with removable compartments, chopsticks, and dishwasher and microwave safe! Click on the picture for a link to buy it. Plant a garden! Spring is the perfect time to try something new and if you have never had a garden you definitely need to start one. If you love fresh vegetables and herbs, you should really try it out. It is really fun spending the time together picking out what you want and how it will look. Bonus the little bit of cost comes back in saving from the produce. If you life in the city like I currently do start a major jar herb garden! Super adorable and great for adding a little freshness to your home, plus you will have a great time trying to keep it alive together. Explore a local city! I don’t know about anyone else, but I’ve been in my college town for three years and have barely seen any of it. Spend a day in the beautiful spring weather and get lost window shopping and trying new cafes. Just make sure to charge your phone so you can find your way home when you’re done! Try a new outdoor hobby together! So running and biking were the bane of my existence for a long time. Avery changed a lot of that for me and now I would love to try going for a run with him or a biking adventure. It is a great alternative to spending money and the bonus of getting a workout in (especially when you have a wedding coming up) is awesome. Visit a local Farmer’s Market! Okay, so Avery and I are obviously involved in our country roots. I love visiting the farmer’s market just to get to see all the fresh veggies. As spring hits full force you will find fresh spinach, eggs, and other goodies galore. You can choose to just walk through and chat and learn about what they are doing, or you can get some treats for the week. This is great if you struggle with your green thumb or space to have a real garden. Have a Spring Cooking Challenge! This is great if you actually just went to the farmer’s market and came back with a bunch of stuff. Compete against each other to make the best dish using what you came home with. The extra challenge? Put a spending limit on the ingredients. You will have a great time cooking and eating together. Plus at the end of the day you might have a special new recipe to add to your daily life. Watch the Sunrise or Sunset! With warmer weather I just find myself gravitating towards being outside. Plan a special occasion to watch the sky burst full of colors. Most people will tell you that they love watching the sunset, but I love watching the sunrise with Avery. It just is a really amazing way to start our mornings together. For my love of sunrises, this was a really beautiful sunset! Have a cookout with friends and family! As much as I love being alone with Avery, I also really love my friends and family. Plan a nice day where everyone gets together for a potluck! Just make sure everyone brings a dish to pass. Bonus points if you can pull a grill out! Attend a free festival or event! With warm weather comes community activities. There is plenty out there to check out so find some near you. They tend to come with free entertainment and some times even free food! Try Swing Dancing! There is an awesome community in my area that does swing dancing once a week that is 100% free with free lessons! Find one near you or make your own. It is a phenomenal time and swing dancing is easy and fun. Most people start planning outdoors ones, so trying something new! What is your favorite spring date? Do you plan to try any of these?